My first full day in Los Angeles began with a ride down Sunset Boulevard. I didn't have a burning desire to actually walk on the Hollywood Walk of Fame before getting to LA, but it was a beautiful day and as good a reason as any to get out of the car and enjoy it. Stef and I exited an underground parking garage via an escalator, leading us right past an entrance to the Kodak Theatre where the Academy Awards are held each year. Our first view upon walking out of the building was that of Jimmy Kimmel's studio. 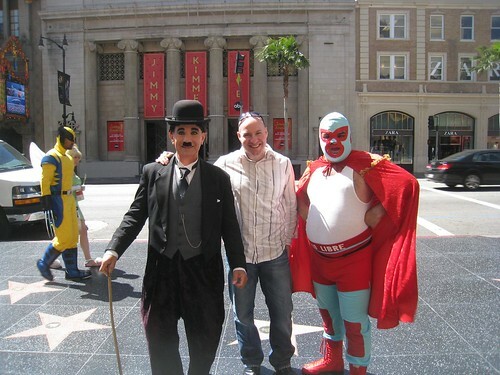 Photo-op with Charly Chaplin and Nacho Libre, with Wolverine and Tinkerbell walking past. Street performers were dressed up as a variety of famous movie and comic characters, and Stef insisted on a photo. I tipped Chaplin and Libre a buck each for their efforts. At the time, I resisted having my photo taken like an embarrassed kid with his parents, but now that I'm back on the East Coast, it's serves as the perfect reminder of Hollyweird. Under a bright warm sun, we walked around outside Grauman's Chinese Theater looking at the various foot and hand prints of the stars on the sidewalk. My hand was a perfect match with Tom Hanks. A half block away was the historic Hollywood Roosevelt Hotel, which we took a quick walk through before grabbing coffee in their small bar, 25 Degrees. 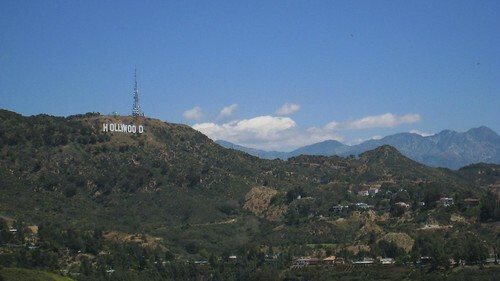 View of the Hollywood hills from outlook point on Mulholland Drive. Back in the car, we cruised up to Mulholland Drive which I'll always associate with the David Lynch movie by the same name, though I've never managed to watch the whole thing. A small parking area associated with a scenic outlook was packed with tour vans. We walked up a few stairs, and then down along a dirt trail on the ridge. To the right, downtown LA, and to the left, my first view of the Hollywood sign. That simple white sign on a green hill symbolized not only LA and California, but the entire entertainment industry. I imagine the sign has served as inspiration for countless struggling actors, models, musicians, and comics who come to LA to make it big. A lot of the places we visited in the Los Angeles area seemed smaller in person than I'd made them out to be in my mind after a lifetime of television and movie consumption. The Hollywood sign was the exception. 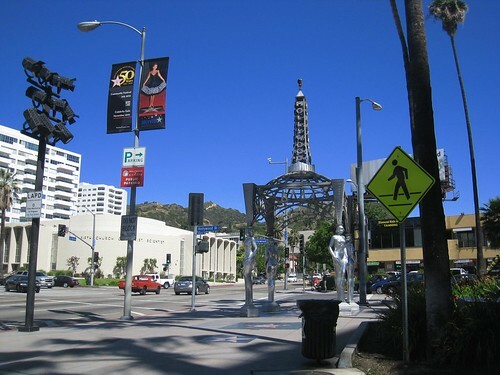 Despite the sunshine, when we drove down to Santa Monica in the afternoon, it was downright chilly due to the wind. The beaches were bare, save for a few runners. 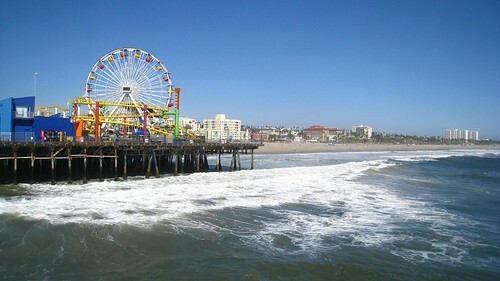 The amusement park rides on the Santa Monica pier were closed due to the weather, and any hot lifeguards must have been off duty as well. Barcelona, Arcachon Bay in France, and now Santa Monica — I've developed a real knack for visiting popular beaches when they're too cold to be fully appreciated. After getting our fortunes told by Zoltan on the pier, we sought shelter in the luxurious Casa del Mar hotel lounge. Large windows allowed us to continue enjoying the beach views in comfort, and we were soon joined by Maja, who does PR for Swiss Tourism. 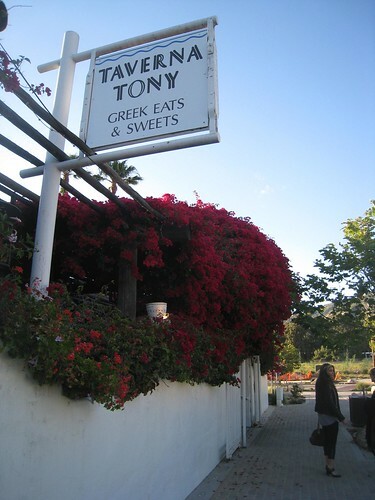 In the early evening, the three of us motored up the Pacific Coast Highway too meet up with Kristin Luna and Steph's husband for a Greek dinner at Taverna Tony in Malibu. We sat outside on a vine and flower-covered patio, but despite being situated near the entrance, there were no celebs hanging out that night.